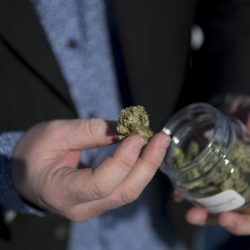 Last month, the Portland Press Herald/Maine Sunday Telegram spent a few hours with Jackson while he “connected the dots,” riding along in a neat-as-a-pin Toyota Camry as he delivered glass jars full of Blue Dream, Super Lemon Haze and White Widow X to well-kept homes in Greater Portland. With an ’80s electropop anthem playing on the car radio, Jackson told the story of how a website designer between gigs ended up delivering weed while navigating Portland’s tree-lined East End, Munjoy Hill and Back Cove. Bret Jackson, owner of the cannabis gifting service Greenlyght, delivers “gifts” to a client in Portland. Jackson’s business, called Greenlyght, is one of about a dozen high-profile marijuana gifting services that have popped up in Maine in the year since the Marijuana Legalization Act went into effect. Companies with names like Elevation 207, Elite Harvest, Kind Guy Delivery and 420ME advertise their gifting policies on splashy websites, Facebook, and even Google Ads. Customers who can’t afford $75 or $100 donations can turn to the more anonymous gifting economy found on Craigslist. But is it legal? Jackson believes it is. He insists that he is giving the marijuana away, which is allowed by the Marijuana Legalization Act. The person who is receiving the gift is paying for delivery, the same way that a person pays a delivery charge when using the parcel post. It’s not just a coincidence, of course, that the price of delivery is commensurate with the price of the product, but Jackson is comfortable enough with this legal loophole that he talks openly about it. Lawmakers in Augusta say it is absolutely illegal, and that gifters are simply drug dealers profiting from the political gridlock that has slowed legislative efforts to roll out a safe, regulated and taxable recreational marketplace. Gifting is just a turn of phrase used to disguise an illegal commercial sale, they argue. The people who pay the $90 delivery charge don’t know if the marijuana is safe, if the person delivering it is reliable or if they are handing over sales tax to the state. But law enforcement in Maine doesn’t seem interested in shutting these gifting companies down. Some don’t know it’s happening, while others don’t see it as a problem. Some, like the Attorney General’s Office, say it is not something that office would be involved with, referring the issue to the Maine Prosecutors Association, which did not return a call for comment. Calls to Portland police about the issue also went unreturned. The Marijuana Legalization Act approved by voters in 2016 allows adults to transfer or furnish up to 2½ ounces of marijuana to another adult so long as it is done without remuneration. Paul McCarrier of Legalize Maine, the group that wrote the citizen initiative, said the gifting clause was intended to allow for marijuana potlucks, a kind of garden party get-together where boutique growers can show off high-quality strains and try each other’s stuff. Lawmakers say marijuana gifts bundled with commercial transactions violate the “without remuneration” requirement of the gifting allowance embedded in the citizen initiative. 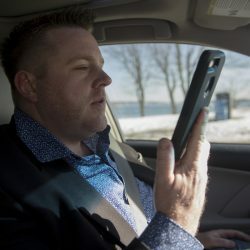 But lawmakers realize that police have no appetite for arresting former Uber drivers like Jackson, a clean-shaven 34-year-old who waves at the neighbors while delivering jars of Blue Dream to Annie, a cheery accountant in Portland’s Rosemont neighborhood. When Jackson walks into Annie’s home – she asked that her last name not be used because she lives alone, and she doesn’t want people to know she has marijuana or the cash she used to pay for delivery lying around – they chat easily about her recent move from Washington, D.C., where recreational cannabis use is legal, but sales of it are not. She used a gifting service there, too, to get the cannabis she needed for a medical problem that is not covered under Maine’s medical marijuana law. They talked about marijuana for about 15 minutes, hanging out in Annie’s kitchen, which was still filled with moving boxes. He handed her a white bag full of five jars of bud and one chocolate chip cookie cooked with cannabis-infused oil that Jackson was trying out on frequent customers for a possible future addition to his gift line. A few minutes later, Annie handed Jackson an envelope with about $400. “See you next month,” Jackson said as he showed himself out. Most Maine law enforcement doesn’t even realize that “gifting” is happening, said Robert Schwartz, director of the Maine Chiefs of Police Association. No chief in his association has raised it as an issue or talked about receiving complaints about it, he said. Most chiefs would rather wait to read Maine’s rewritten legalization law before deciding upon an appropriate response, preferring to devote their limited time and resources on problems like the opioid epidemic, he said. The Cumberland County Sheriff’s Office fielded one gifting complaint in 2017 from a medical marijuana caregiver claiming a gifting service was stealing customers. The office referred the complaint to the police in Portland, where the service was operating, and the Attorney General’s Office, which also oversees licensing, but the sheriff’s office does not know the disposition of that referral. The sheriff’s office considered the complaint to be more of a turf issue than a public safety concern. Jackson said he has talked to local police officers who have told him they don’t spend their time pursuing marijuana cases, especially gifting services that exploit a legal gray area in a law that is likely to change soon. While he is speaking openly about his business now, hoping to garner political support for the addition of a state delivery license category to the proposed rewrite of the adult-use law, Jackson said the transactions themselves are virtually invisible, and harm no one. Jackson founded Greenlyght last summer as a way to pay his bills when the Portland web designer found himself out of work. He had read a news story about another marijuana gifting service, and didn’t see that lead to any high-profile arrests. Then his brother-in-law complained about how long that company had taken to deliver his cannabis gift – the company had told him it would call right back, but five hours passed. When it did call back, the service told him it couldn’t deliver until the following day, and then showed up 30 minutes late for the meet, Jackson said. Bret Jackson conducts business for his cannabis gifting service. His deliveries are “definitely not the black market,” he says. Jackson, who lives in Portland, thought about that over the weekend. He talked it over with a friend who grew marijuana for him. Jackson decided to lay his hands on a pound of marijuana, but to buy it in stages in order to keep the amount he had on him below the 2½-ounce personal possession limit. He put up his own Craigslist ad on Sunday night. He figured if he couldn’t sell it, he’d keep the cannabis and smoke through it with friends. But within a day, Jackson was delivering his first gift. He was nervous when he met the client, whom he knew only as Adam from Brunswick, in the Whole Foods parking lot in Portland that Monday morning in June. Jackson had planned to dress the pot up, putting it in a jar so the client could see what he was buying, but it all happened so fast that he ended up handing over the quarter-ounce of Sour Diesel in an unlabeled canning jar in a Whole Foods bag. Perhaps it is fitting for a company whose entire business plan is built on exploiting a legal loophole that Jackson can’t field every question about his operation with ease. Jackson stumbles when it comes to how he acquires the cannabis that he gifts. He admits that he doesn’t grow his cannabis and that he gets the cannabis he gifts from Maine caregivers. He won’t name them, but he said he uses four caregivers right now, and that there are more who want him to start gifting their marijuana. Under state law, however, caregivers are prohibited from selling marijuana to anyone without a medical card. Jackson does not have a medical card. Bret Jackson shows an example of Greenlyght’s product. When asked about sales tax, Jackson pauses. A minute passes, then two. The marijuana is free, he said. What about taxes on the delivery fee? He said he didn’t know that he has to pay tax on that. State tax officials claim that Greenlyght is on the hook for at least the 5.5 percent sales tax on the delivery, but argues that it should really be paying the 10 percent marijuana tax required by the Marijuana Legalization Act on all retail sales. It includes no mention of a gift tax, however. A few days after the tax question was posed, however, Jackson said he had hired an accountant to teach him how to collect sales tax and how to get right with the state. As of publication, Jackson had not yet registered with the state to collect taxes, either under his name or Greenlyght. But even large amounts of sales tax aren’t generally turned over to the state more than quarterly. He only registered Greenlyght as a limited liability company with the state after talking to the Telegram. A spokesman for Maine Revenue Services said it does its best to educate the public regarding its obligation to collect and remit sales tax, and that most individuals and businesses meet their tax obligations. When they don’t, the department works with them to reach compliance, he said. “Occasionally, changes in technology or the law open emerging markets to consumers who may not normally engage in taxable business ventures,” said David Heidrich, spokesman for Maine Revenue Services. Jackson said he hadn’t expected Greenlyght to become his full-time job when he started. He expected the state would set the framework for retail pot sales within a few weeks. In that context, he likened himself to someone who cuts and sells wood a few times a year, who is not required to pay sales tax on what is considered to be an occasional sale. Before he knew it, though, the occasional delivery turned into a thriving business. And political dickering among lawmakers and the governor has dragged on for more than a year, meaning legal sales are unlikely to happen until 2019. With as many as 10 gifting deliveries a day during the busy tourist season, some of them worth up to $400 each, Jackson said that he figures it’s time to look into Maine’s voluntary compliance program for tax delinquents. He knows he will have to “get right on his taxes” if he hopes to persuade Maine to embrace home delivery, something lawmakers have been trying to prohibit. He’s not the only one – many medical marijuana caregivers acknowledge the same sales tax debts. In states where delivery is banned, some companies have continued to use gifting to get around the transportation prohibition, but Jackson said he is unlikely to do it that way. He said he wants a “completely legitimate” job in the cannabis industry, something he can talk about openly, as he was doing one sunny cold day in February while showcasing his gift bags at a picnic table on the Eastern Promenade, a frequent delivery location.